Defending series champion and equestrian sports legend, Germany’s Isabell Werth (49), kicked off her FEI Dressage World Cup™ 2018/2019 campaign today with a convincing win with Emilio at the second leg of the Western European League series at Equita Longines in Lyon, France. With two Technical scores over 80 percent and one Artistic mark of 93 percent, the six-time Olympic gold medallist racked up a total of 84.410 that left her well clear of Sweden’s Patrik Kittel (42) in second and Antonia Ramel (33) in third. 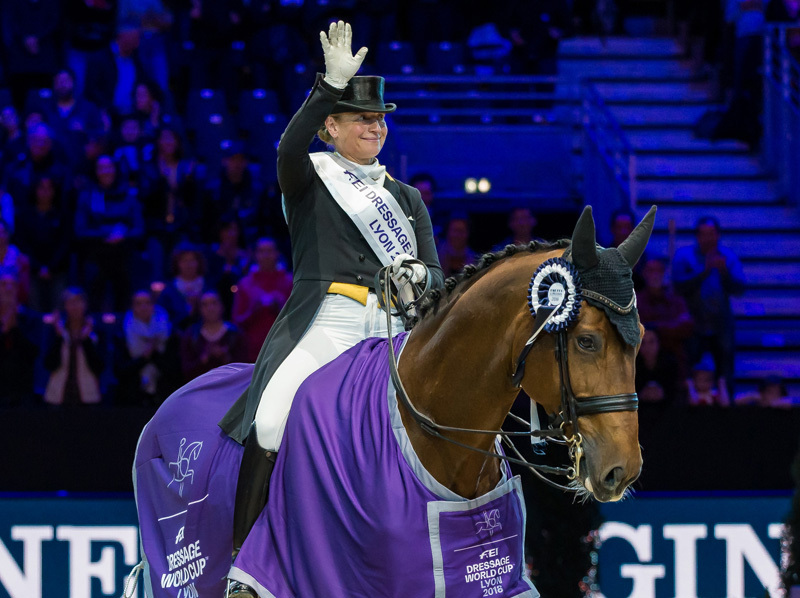 Werth, who took triple-gold at the 2017 FEI European Championships and double-gold at the FEI World Equestrian Games (WEG) just seven weeks ago, is already aiming for a fifth FEI Dressage World Cup™ title, and her third in a row, when the series finale returns to Gothenburg, Sweden next April. However she only just managed to keep Kittel at bay in yesterday’s Grand Prix and was deeply disappointed with that performance. But with typical skill and determination, the lady who has three horses in the top four in the current World Rankings just turned it all around again this evening with a sparkling ride that left the result beyond doubt. Great Britain’s Hayley Watson-Greaves (35) and Rubin’s Night raised the bar to 77.355 percent in the closing stages and young Spaniard, Juan Matute Guimon (21), slotted in behind her when posting 77.070 for an eye-catching test with Quantico that included a one-handed pirouette. But Werth blew that all into infinity with her massive score, and it was the two Swedes who proved her closest rivals at the end of the day. Ramel’s 80.060 with Brother de Jeu was hugely impressive and took even her by surprise. But the talented rider who has been on two winning Nations Cup teams for her country this year has been training diligently with three-time Olympian Kittel for the last two years, and he was very proud of her this evening. He is often coached by Werth, and earlier this week he visited her to ask her advice about his stallion, Delatio. “I was at Isabell’s on Monday because I wasn’t sure if I should take him to Lyon – but she said yes!” said the Swedish star who scored a handsome 80.980 for second place. Werth plans to compete all three of her top horses during the 10-leg Western European League, and Emilio will be back in action for the next leg in Stuttgart (GER) in two weeks’ time where Bella Rose will also line out.